A new theatrical production introduces the extraordinary life of a historical saint. Kuala Lumpur, Malaysia -- December will introduce to Malaysians the first-ever stage performance on the life story of the iconic Tibetan Saint, Lama Tsongkhapa who founded the fastest growing school of Tibetan Buddhism in the world today. The musical performances shares with us the simple message of one person's journey to realise the highest human potential, bringing to life his many spiritual adventures, triumphs and accomplishments. The play intertwines tradition with modernity, taking us through the journey of one man's determination to go where only Buddhas have gone before. 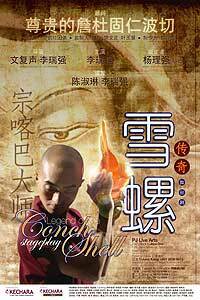 Playing the main role of Lama Tsongkhapa, celebrated dancer Lee Swee Keong portrays for us the heart and soul of the play, animating the magnificent and inspiring story of a sage who was often known as the “Second Buddha”. The life and works of this extraordinary being has been compared only to the original Buddha of India, and his teachings continue to be upheld today by thousands the world over. This innovative and unique production is directed by renowned director Woon Fook Sen, well known in the theatre/drama circles for his professionalism and dedication. He is backed by a talented cast and crew, which includes the popular artistic dancer Lee Swee Keong, well-known celebrity fashion designers Bill Keith, Eric Choong and others. Lee an exponent of the Japanese “Nyoba Kan” dance, breaks away from his usual dance style to interpret the free and uninhibited Tibetan style of dance. As choreographer and lead dancer in this production, he expressed that “The Legend of the Conch Shell” is a new and exciting experience which stretches his imagination and dancing skills to the limit. Under the skilful direction of Woon, a whole new approach in theatre has been embraced to depict the unparalleled story of a great reformist in the history of Tibetan Buddhism. The script is adapted from a historical epic, encompassing dance art and spirituality. The production is created using Tibetan religion, culture and arts as its key elements, bringing to audiences an extraordinary story imbued with history and spiritual abundance in a classical setting. This production is brought to you by the Kechara Buddhist Organisation and was inspired by His Eminence Tsem Tulku Rinpoche, Spiritual Guide of Kechara. This much-awaited public performance will run on December 17, 2009 (8pm), 18 (8pm) and 19 (3pm & 8pm) at PJLA, Jaya One, Petaling Jaya. Tickets are by donation of RM40 or RM60. Lama Tsongkhapa's story can be traced back to the time of Shakyamuni Buddha. Buddha had prophesised to a young boy that he would be reborn as a Dharma teacher in the future in the Land of Snows, Tibet, and presented the boy a conch shell. The boy was later reincarnated as Lama Tsongkhapa. Lama Tsongkhapa was born in 1357 in Huangzhong in Qinghai Province. At three years, old, he had already taken layman’s ordination and from the age of six, began learning from the most influential scholars and erudite masters of his time. He quickly achieved unparalleled scholastic mastery and was skilled in both the arts and the sciences. When Lama Tsongkhapa was born, Tibetan Buddhism was in a state of degeneration - the monks did not hold vows strictly and the teachings had become distorted. Lama Tsongkhapa took the responsibility of restoring the pure teachings. To accomplish this, he built a monastic institution, re-established authentic Dharma teachings and developed a learned monastic community with strict observation of vows. During his lifetime, Lama Tsongkhapa completed many great writings and philosophical treatises on ethics, the middle-path, wisdom, logic, medicine and history. He wrote a masterpiece called the Lam Rim Chenmo (Great Exposition of the Stages of the Path to Enlightenment), a structured guide to Enlightenment. This is considered to be amongst his greatest and most beneficial works which is still being studied until today. His legacy was the establishment of the largest Tibetan Buddhism school today – the Gelug, which means ‘virtuous’, or Yellow Hat school. Amongst his most famous deeds are the construction of Gaden, Drepung and Sera Monasteries in Tibet, which have now all been reestablished in India. In 1419, at age 63, Lama Tsongkhapa passed away, but his lineage lives on throughout the world and his influence has been very widespread. During the Ming Dynasty, in Emperor Yong Le’s reign, there was already a record of Lama Tsongkhapa in the imperial archives showing how influential his teachings had become. Today in Beijing’s Yonghe Gong temple, Xining’s Wu Tai Shan and Qinghai’s Kumbum Monastery, Lama Tsongkhapa's tradition is still evident. Closer to home, within the Kechara Buddhist Organisation in Malaysia, under the spiritual guidance of His Eminence Tsem Tulku Rinpoche, Lama Tsongkhapa’s tradition and teachings continue to be accessible to benefit all.